Home » What is Artcasting? 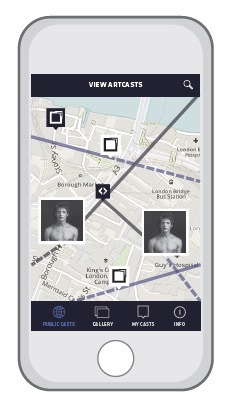 Artcasting is a mobile application that invites visitors to exhibitions to choose an artwork and digitally ‘cast’ it on a trajectory to a new location, adding stories about their choice of cast and their associations with the artwork, and re-encountering their own or other artcasts in the future. Itunes Store (for iPhones and iPads). Google Play store (for Android smartphones and tablets). Artcasting helps visitors make imaginative connections with artworks, and helps galleries and museums understand how people are experiencing and engaging with their exhibitions. With an emphasis on movement, trajectory and imagination, Artcasting offers a way of experiencing a gallery exhibition as mobile and open to new interpretations and encounters both in and beyond the room. Choose any artwork from the exhibition to create an artcast. You can also save artworks, and use Artcasting later from other locations. Once you’ve chosen an artwork, the app will guide you to think about where, when and why you want to cast it. You can cast to places you know well or places you’ve only imagined, and to the past or future. The map shows all the artcasts that have been sent. Your own casts appear in green. If you feel inspired by another cast, you can re-cast it. You can also search and filter art-casts. For example, you can see where else your chosen artworks have been cast (co-casts), or search for specific tags or artworks. If you go to a physical place where an artcast has been sent, you’ll encounter it there and receive a notification. Open the Artcasting app any time to see if any casts are near you, or send a new artcast! it did make me think about the art in ways I hadn’t necessarily explored before. What you are doing here is providing ways for people to express themselves, to share with others their experience of attending to an exhibition. I like how simple it is and how the audience is encouraged to think about the artwork differently / engage with the artwork originally.